Engineers Preparing NASA's Gigantic Space Simulation Chamber for Massive Test. 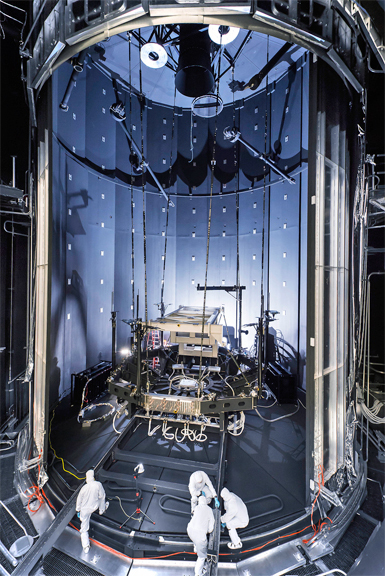 [SatNews] This photo was captured from outside the enormous mouth of NASA's giant thermal vacuum chamber, called Chamber A, at Johnson Space Center in Houston. Previously used for manned spaceflight missions, this historic chamber is now filled with engineers and technicians preparing a lift system that will be used to hold the James Webb Space Telescope during testing. The James Webb Space Telescope is the scientific successor to NASA's Hubble Space Telescope and will be the most powerful space telescope ever built. Webb is an international project led by NASA with its partners, the European Space Agency and the Canadian Space Agency.